We are a XERO Accounting software partner and recommend their solution for businesses. It has been designed for the business user and is therefore one of the easiest solutions available on the market. We can assist in setting up the software for you or complete all your monthly and annual bookkeeping. The main screen is a dashboard which includes bank balances, invoices, bills and expense. You can add more to the dashboard so you can see at a glance the important things to your business. XERO is a cloud based accounting system, this means that there is no software to load onto your computer and you can logon using any computer connected to the internet. They are high on security so you don’t need to worry. One of the main advantages of being cloud based is that if you have a problem and you are registered with us we can take a look and advise you for a solution or complete it for you. 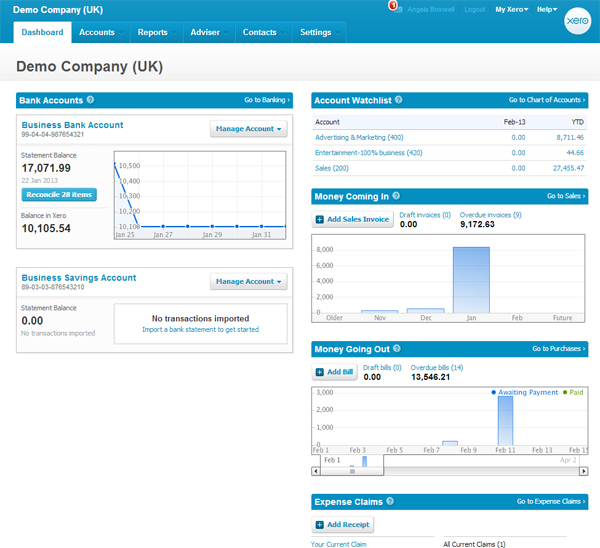 There are many reports available within XERO. They are easy to set up and print off. If we are completing your bookkeeping, at the end of the period we will produce the relevant reports and you can view them from your own computer. XERO Account software accepts bank feeds from many banks in the UK. Once set up you can easily update your bank balance and reconcile it. There are easy features to help you reconcile the bank so you do not have to keep repeating the same task, this can save time and money for your business. Are you often away from your office working? Their free app includes creating invoices and emailing them direct to the customer, complete expenses claims including mileage and photo receipts. This can save a lot of time when you return to the office to complete paperwork. You can easily design and create your own invoices, email them to clients and get paid online. Within the dashboard you can view the outstanding invoices. If you are VAT registered you can record and track your VAT and produce the VAT return at the quarter end. If XERO does not have all the features for your business they have a whole range of add-ons provided by business partners. If you are not sure if the software is suitable for your business, why not take a free 30 day trial, sign up and get going within minutes. They have included a demo company so you don’t have to spend ages entering data to try it out. If you require any further information or still not sure if the software is suitable for your business, give us a call and we can guide you through. Our telephone number is 024 7654 3534 or Email. We work in the areas of Leamington Spa, Coventry and Rugby. The Littlefoot Bookkeeping website is © copyright 2013-2019 by Angela Boxwell.